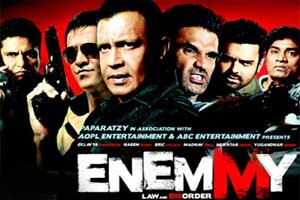 Enemmy is a 2013 Bollywood action thriller film directed by Ashu Trikha and produced by Yogeeta Bali. The film stars Mithun Chakraborty, Sunil Shetty, Mahakshay Chakraborty, Kay Kay Menon, Johnny Lever, Zakir Hussain and Yuvika Chaudhary. The soundtrack of the film is composed by Bappa Lahiri, Gourov Dasgupta and lyrics are penned by Shabbir Ahmed, Manthan. Here is the link of all the songs lyrics and videos of Enemmy - Law And Disorder.